DealGest is an adware application that should not be trusted. Numerous online shoppers are deceived by various promises made by the publishers into installing this potentially malicious application. DealGest should offer discount deals and various commercial ads with the lowest price possible. Unfortunately, it is not true, as adverts provided by DealGest are random and unreliable. If you want the best deals, you will have to find them yourself. Do not hesitate and remove DealGest from your PC in order to keep your system secure and running smoothly. To learn more about this invasive adware application, please read the article. We also provide a detailed removal guide for your benefit. DealGest is a typical adware application. Just like so many of its counterparts, it installs browser extensions to all the popular browsers on the market (Internet Explorer, Mozilla Firefox, and Google Chrome). These extensions are used by the program to display various third-party commercial advertisements within your browsers. These adverts will be displayed randomly whether you like it or not. Some adverts might even contain various redirect links to potentially corrupted websites. It has been revealed that by clicking on adverts provided by DealGest you might land on a fake internet store that was setup by cybercriminals. Such websites are used in order to steal personal online shoppers’ data. If you encounter a web store that is unknown, you should do as much research about it as possible before purchasing anything from it. To restore regular browser activity, you must remove DealGest ASAP. If you tend to download freeware applications, you must be extra careful while installing them on your PC. Bundled installers are extremely common among freeware. 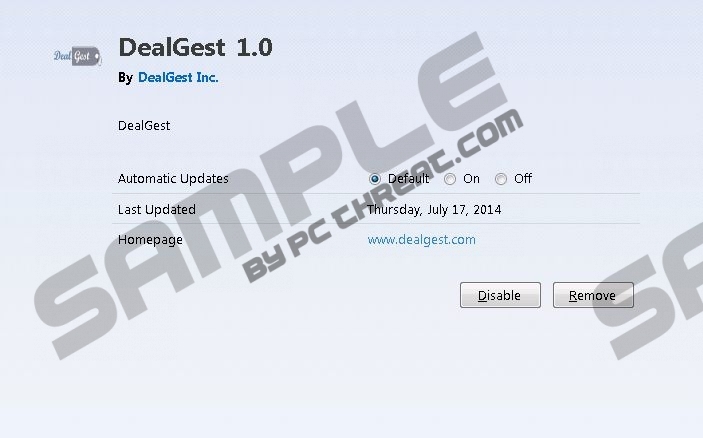 DealGest is also mostly distributed with various freeware installers. Users to dot pay proper attention while installing software onto their system; therefore, it is quite natural that they get their systems infected. Avoid dubious third-party hosting websites, pay extra attention while installing anything on your system, and practice safe browsing habits in order to reduce the risk of getting your PC infected. A security conscious user should be running a professional antimalware tool at all times. Such tool provides real-time security and can detect potentially malicious websites or downloads. Furthermore, removal executed by a reliable antimalware program ensures that the infection was removed entirely. We provide a detailed DealGest removal guide below. Even though, manual removal is effective it is still firmly advised to scan your system with a trustworthy antimalware application afterwards. Locate DealGest and the double-click it to uninstall. Select DealGest and click Uninstall. Quick & tested solution for DealGest removal.